In the USA designer dog breeders created what is known as the silver or platinum Labrador by crossbreeding Labradors with Weimaraners. Some of the darker silvers are marketed as charcoals and silver breeders even claim to have invented a champagne coloured Labrador! Silver Labradors are a threat to the pedigree integrity of the Labrador breed and are not accepted as purebred dogs by any legitimate kennel club registration authority in the world. Due to the coat colour dilution gene locus from the Weimaraner, these silver dogs suffer from debilitating skin and thyroid problems. Many silvers/charcoals have problems with hip dysplasia due to generations of breeding from untested dogs. Neurological disorders such as epilepsy are also widespread in silver Labradors due to the intensive in-breeding that is required to maintain the unnatural silver colour. Every silver Labrador in the world eventually traces back to a few kennels in the USA that housed Weimaraners and Labradors together. The colour has never been known to occur naturally in the breed. Black, chocolate or yellow Labradors do not appear in "dilute" form. 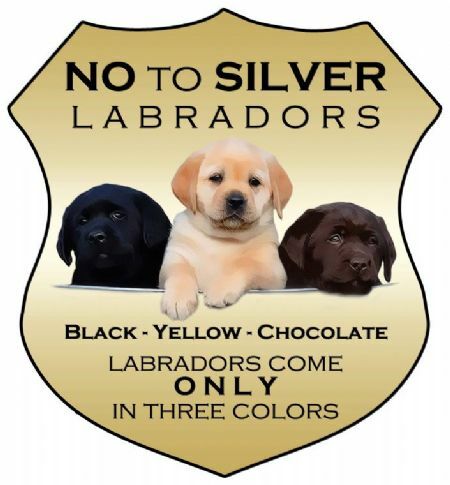 Silvers imported from the USA are now present in Australasia so it is a case of buyer beware and always check with a reputable breeder or breed club before purchasing any Labrador Retriever puppy. Silver breeders often market their dogs and puppies on websites like Trade Me as being "dual registered" or as coming from "American field trial (hunting) lines" or "American gundog lines". The New Zealand Kennel Club pedigree database has now been corrupted by the presence of silver Labradors falsely registered as chocolate Labradors therefore NZKC pedigree papers for Labradors can no longer be regarded as an assurance of purity of pedigree.